Join us for the 2018 Muddy Chef Challenge in Manchester, Vermont. We have a new location (still close to town), that offers indoor hot showers and bathrooms, complete privacy (although the carnival last year was pretty cool) and more room to stretch out and set up your campsites. New events, tech sessions with aftermarket parts suppliers, industry insiders, and experts and lots more. Join us for three days of off-roading, overlanding, sporting field events, African safari style camping, challenges, a fancy dress cocktail party and two world-class vehicle-based gourmet cooking challenges. Want to know more about the event? Visit www.muddychef.com for more information. Hope this video works. Yes, that white thing in all that mud is the Rovers North LR3 project car on its first off-road trip. UPDATE - the new campsite layout at Hunter Park in Manchester. One question we constantly are asked is "What does my registration include?" I've updated the registration page in hopes of explaining what is included for the Muddy Chef Challenge. Remember, registration is PER-TEAM, not PER-PERSON. Don't forget about the Low Range Games on Thursday, July 26, 2018. Three events that any Land Rover can participate in. The first is Rat Cage, the second Service Bay, and the third is the legendary Duct Tape Genius. Mayhem will ensue! What better way to work up a thirst for Aaron and 13th Street Cocktail Catering libations? How about an ice cold Stony Creek Beer? Or head over to the official Muddy Chef Pub just a short walk away from the event site. Quick update on the 2018 Muddy Chef Challenge. We are very pleased to include the fantastic Land Rover collection of High Meadow Farm. 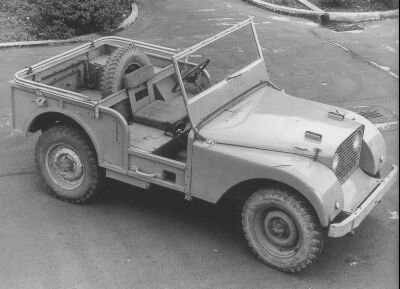 High Meadow will have a number of rare vehicles on display at the MCC including an exact copy of Land Rover #1 the Center Steer.